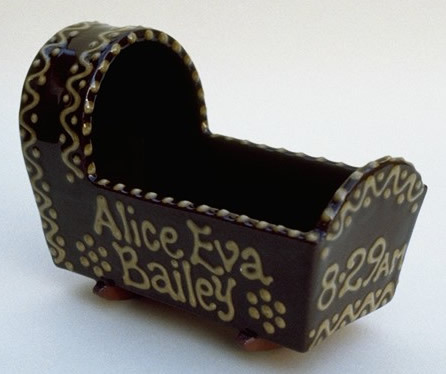 Slipware cradles were traditionally made as christening gifts for babies or as marriage gifts, symbolising fertility, for newly-wed couples. Many were made in Staffordshire in the 17th and 18th centuries, and examples can be seen in several museums. Alsager Pottery cradles are individually hand-made by the slab-building technique. (A method used since ancient times). They are made up from pieces of clay cut from a hand-rolled sheet of "slab" and carefully joined. As with the 18th century cradles the decoration is slip-trailed and can incorporate special wording, for example a motto or a baby's birth date and name or initials. Special cradles can be made to order.